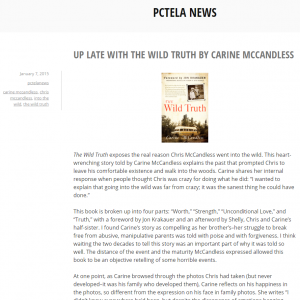 Up Late With “The Wild Truth” by Carine McCandless? 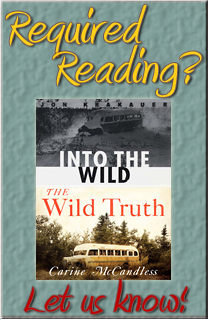 This book is broken up into four parts: “Worth,” “Strength,” “Unconditional Love,” and “Truth,” with a foreword by Jon Krakauer and an afterword by Shelly, Chris and Carine’s half-sister. I found Carine’s story as compelling as her brother’s–her struggle to break free from abusive, manipulative parents was told with poise and with forgiveness. I think waiting the two decades to tell this story was an important part of why it was told so well. The distance of the event and the maturity McCandless expressed allowed this book to be an objective retelling of some horrible events. At one point, as Carine browsed through the photos Chris had taken (but never developed–it was his family who developed them), Carine reflects on his happiness in the photos, so different from the expression on his face in family photos. She writes “I didn’t know everywhere he’d been, but despite the dissonance of emotions banging through me, I was glad he’d found what he was looking for.” And as she read his journals, she came to understand “Although he dreaded his impending death, he still died at peace, because the paths… See the complete story on PctelaNews.com.